Another great episode! The full transcription will be on our blog starting 6/18/18. 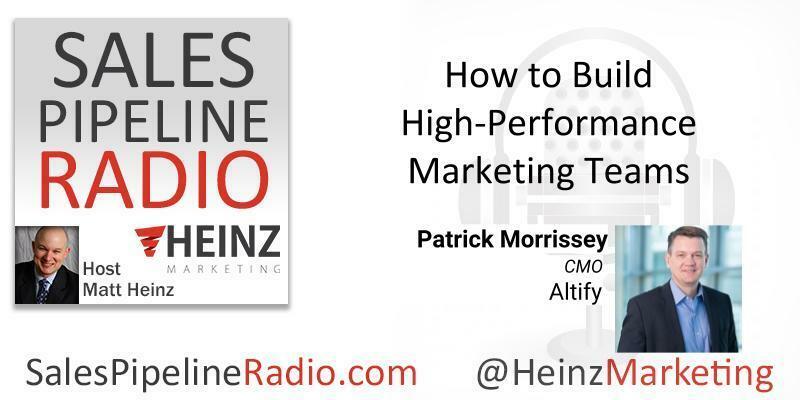 I asked Patrick what are some of the keys you find to building really high performance marketing teams that can deliver results? More from Patrick: I am a growth-driven marketing, sales and business development executive in high technology focused on building high performing teams, building lasting relationships and delivering results. I am also an advisor to innovative start up companies. I run marketing, alliances and channels at Altify. We focus on making the lives of sales people better by delivering great software that help strategic sellers win the deals that matter. This entry was posted on June 13, 2018 at 5:23 pm and is filed under Hire Power Radio with tags Guest: Patrick Morrissey. You can follow any responses to this entry through the RSS 2.0 feed. You can leave a response, or trackback from your own site.